2015 AIMES Award for Excellence in IT, Innovation and Science winner Sian Simpson receives her award from Massey University Vice Chancellor Steve Maharey. 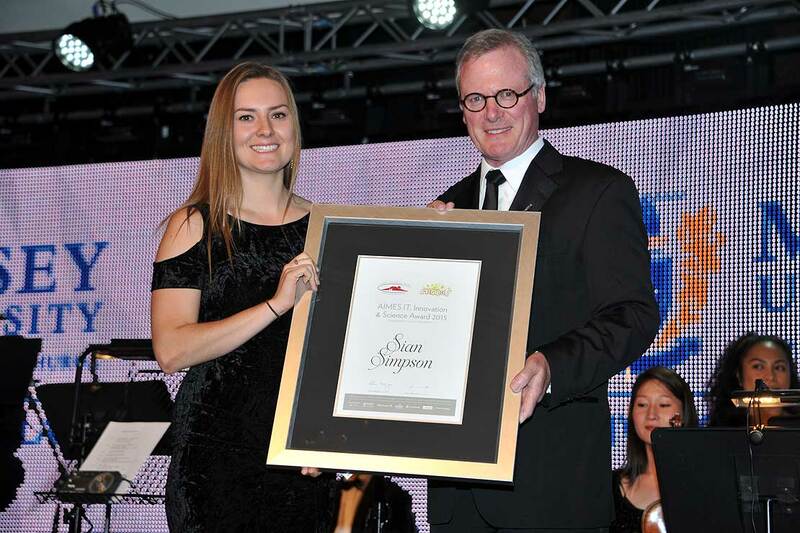 Twenty-four year old distance student Sian Simpson says it was “mind-blowing” to win an award at the 2015 AIMES (Arts, IT, Innovation and Science, Music, Education, Sport and Service to the Community) Awards. Ms Simpson received the Massey University Award for Excellence in IT, Innovation and Science at a gala dinner in Auckland on Friday. Currently based between San Francisco and New Zealand, she is working for Kiwi Landing Pad and 90 Seconds, while studying a Bachelor of Business Studies in Marketing and Entrepreneurship. The AIMES awards are the innovation of the North Harbour Club, a group of local business people aspiring to help talented youth achieve even more. 2015 marks 20 years of rewarding youth excellence in the region. Entrepreneur Sian Simpson says it was overwhelming to be included in such a talented group. “The talent emerging out of New Zealand, and in particular Auckland’s North Shore is phenomenal, out of this world. Ms Simpson runs the Kiwi Landing Pad, a non-profit organisation in San Francisco, sponsored by New Zealand Trade and Enterprise and high profile New Zealand technology investors, entrepreneurs and corporate sponsors. It offers support to New Zealand technology companies that wish to expand into the US market. But as if full time work and study isn’t enough, she is also helping some of Massey’s community establish a Student Entrepreneurship Club.